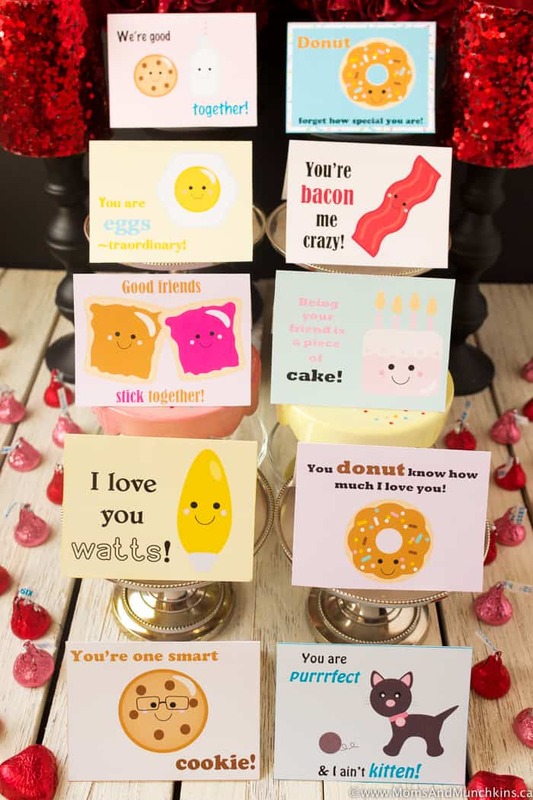 It has been 6 years since our last Punny Valentines freebie so it’s time to add another, don’t you think? These are designed to be cards you fold and open (not just a flat card) but you can cut them into a flat card if that fits your needs better. Some are designed to hand out to classmates and others are more for a significant other – I’ll explain more about that below. You can either write inside the card (for the ones that fold open) or write the “to” and “from” on the back of the flat card. 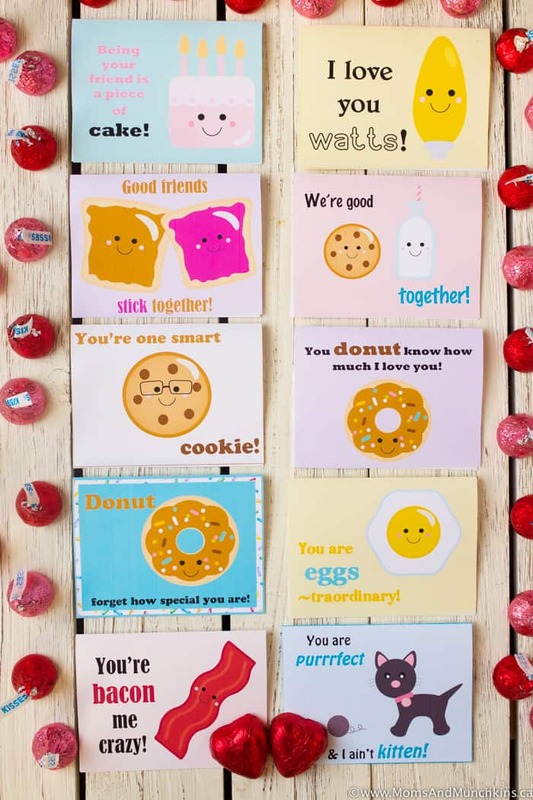 These are free printables so feel free to print as many as you need! Being your friend is a piece of cake! Could pair this with homemade cupcakes. Good friends stick together! Could pair this with a sticky snack like a slice of homemade marshmallow cookie pizza. We’re good together! Could pair this with homemade cookies and a small carton of milk. You’re one smart cookie! Could pair this with cookies. Donut forget how special you are! Could pair this with a small bag of mini donuts. You are eggs-traordinary! Could pair this with Easter egg candies. You are purrfect & I ain’t kitten! Could pair this with fish shaped crackers or gummy candies. I love you watts! Could pair this with some small electronic gift. You donut know how much I love you! Could pair this with a gift card to the local donut & coffee shop. You’re bacon me crazy! Could pair this with breakfast in bed. Adorable artwork courtesy of Erin Bradley Designs. 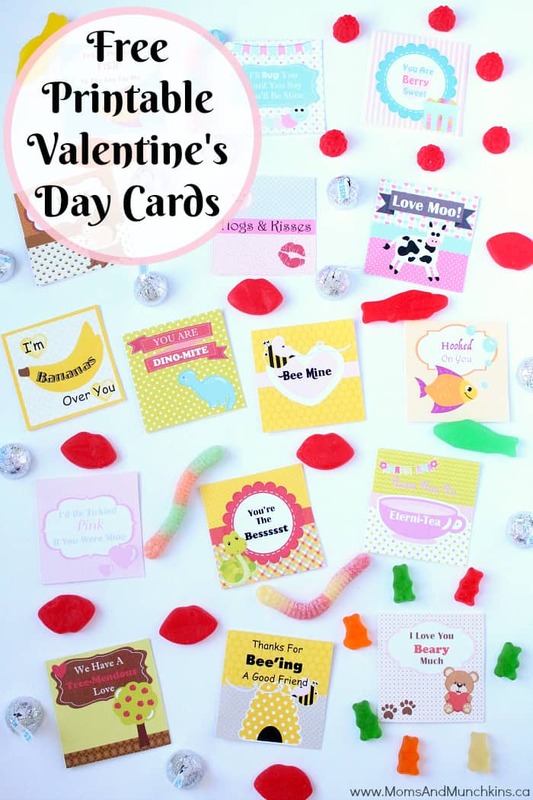 For more Valentine’s Day ideas like free printables, sweet treats, more free printables, party ideas and more, visit our Valentine’s Day page. Plus don’t miss Punny Valentines: Part One! Stay updated on the latest family fun ideas by following us on Facebook, Instagram, Twitter and Pinterest. I don’t see where to click to download these and I’ve now already placed my email in to subscribe… please make it a little more clear. thank you.